Sun warming her back, Hilary Haylock 91 (nee Wilson), chats in the room that was her nursery when she came to her father’s family homestead, Lethenty in Bulls at the age of 18 months. She grew up surrounded by exquisite antique furniture. And the walls of Lethenty, many of which retain the original wallpaper and sarking, were adorned with portraits of ancestors, her father’s massively antlered deer trophies, and beautiful tapestries embroidered by her grandmother, “Granny” Anne Wilson. 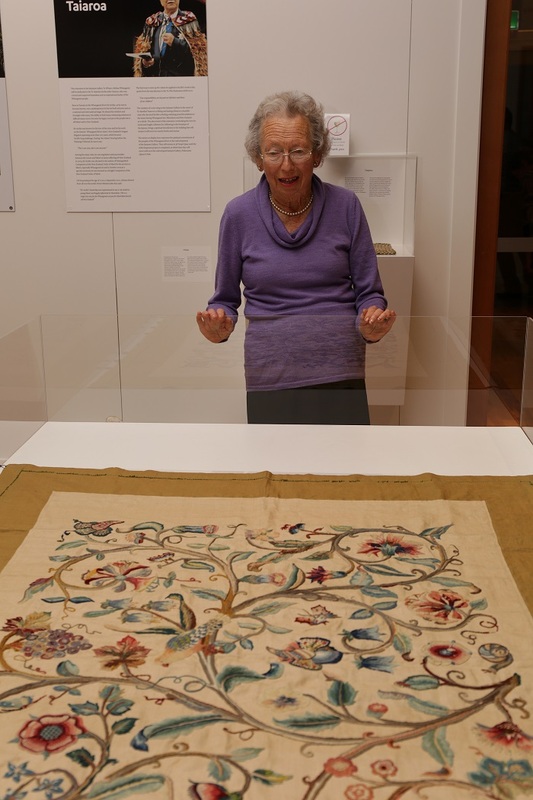 Annie Wilson gifted two tapestries to the Sarjeant Gallery in 1922 one of which, a crewel embroidery in the Jacobean style, is on display in the exhibition Revealed: Collection discoveries from our recent move until 18 September 2016. The tapestry motifs bring the exuberance of plant life into the two-storey neo-Georgian house, which the Wilson grandparents built in 1914 to replace the original, much smaller dwelling that was destroyed by fire. Mrs Haylock retains snapshot memories of Granny as an old lady always dressed in black, “a delicate woman, little – about my height,” very intelligent, well educated and a superb embroiderer. Granny met her Scottish husband James Wilson, in Australia when he was doing a farming cadetship. They moved to New Zealand and had three sons and two daughters. Granny received a good inheritance, which helped when buying their first home in Bulls. Annie’s father believed in women having money, and she in turn provided well for her daughters Jean and Nancy. Mrs Haylock inherited the homestead from her aunts whom she knew well as her father, Robert “Major Bob” Wilson had moved back to Lethenty when his wife of three years, Doris Cracroft Wilson died 10 days after giving birth to their son, Murray. Mrs Haylock has lived much of her life at Lethenty, with a few absences for boarding school, university in Dunedin where she studied Home Science, teaching for a year in New Plymouth and 10 years following her marriage to Owen Haylock. The couple and their three children moved to Lethanty in the early 1960s to keep Major Bob company. Mrs Haylock was active in the Girl Guide movement where her talents for organizing were much appreciated and in 1984 she received the MBE for services to Guiding and the community. Lethenty has been home to the Wilson family for over 100 years. 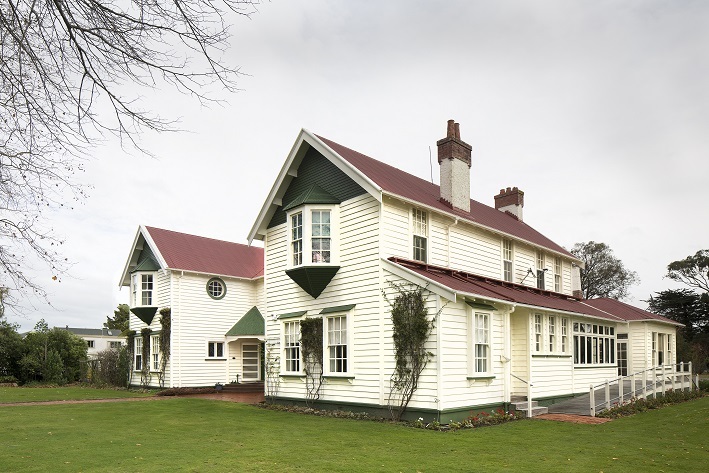 The house has hosted weddings, fund raising events, and community activities but Mrs Haylock feels it is time to move into smaller, warmer accommodation, while retaining a strong connection with the historic house.